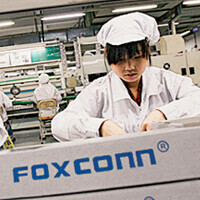 Foxconn hires 100,000 workers for Apple iPhone 6 assembly? A report out of Taiwan on Monday, says that contract manufacturer Foxconn has just set a company record by hiring 100,000 new employees at one time. What device has the kind of clout that could require a hiring of this size? Why, the Apple iPhone 6 of course. And it is not only Foxconn adding head count, thanks to the latest iteration of Apple's smartphone. Pegatron, the contract assembler that will be putting together 30% of iPhone 6 handsets, has just jacked its work force by 30% according to the same report. Right now, work should be starting on the assembly line for the 4.7 inch Apple iPhone 6. Later, the 5.5 inch Apple iPhone phablet should be rolling off the line. Interestingly, Foxconn hired 90,000 new workers last year to help them manufacture the Apple iPhone 5s. Besides the Apple iPhone 6 and the phablet variant of the phone, the tech titan will most likely continue to produce a 4 inch model, which will be the entry-level handset in Apple's 2014-2015 line-up. Americans will not work for low payment as Chinese workers do. Heck, even McDonalds workers across America are requesting $15.00 an hour. That's an awful idea, and will negatively impact the very people it was set out to help. When governments interfere with the free market, only bad things will happen. That's not going to happen since Foxconn's facilities are in mainland China. What kills me is they are still going to make 4" iPhone's still. Just too small. I suppose these workers are China's equivalent of seasonal migrant farm laborers. Inb4 get/need more "nets" joke. How many staff to look after the staff? Not surprising, as of 2012, China has 1.351 billion people vs USA's 313 million population therefore labor there is cheap. Bad thing though, this cheap labor takes away other people's livelihood. Lots of companies moved the production/manufacturing to China. That number is huge, wish American companies could do something like that. So Foxconn being Taiwanis company is hiring Chinese to do the work? Something I really want know is if these employees are permanent or temporary until they have produced enough phones to beat demand? Half of them are hospitality agents for tim cooks visits .That way he justifies $650.00 for a phone with a gig of ram and a dual core processor.